Wellington aspires to be the leading Smart City in New Zealand. A Smart City is characterised by the integration of technology into a strategic approach to secure sustainability, citizen well-being and economic development. In taking this a step further we propose the concept of an intelligent and sensitive city, which provides VUW with opportunities to build leadership that is people focused in its research and use of big data, sensor technology and the internet of things. The research areas applicable to intelligent city technology and solutions include most areas of the university, for example - architecture, planning, urban design, information technology, mobility, social geography, sociology, psychology, philosophy, public health, landscape, ecosystems, energy systems, materials science, engineering, business, governance and law.Our initial areas of focus will be in developing and applying instruments and models that are suitable for the design and planning of cities at urban and regional levels to enhance liveability. We propose that developing systems to present immersive and interactive 3D visualisations of data will be an integral part of understanding contemporary intelligent cities. Cities are complex phenomena. Developing a digital virtual Wellington will allow urban managers and researchers to interface with a multitude of complex physical and social data, while integrating advanced data analytics into the urban design and planning processes to enable the use of smart city data in public planning, engagement, and decision making, to improve the liveability and resilience of cities. Our image gallery only captures the Virtual Reality (VR) environments in 2D. Visit the Future Design Generation exhibition for a fully immersive hi-fidelity experience. This project examines how intelligent virtual environments can be used to explore an expanded toolset for architectural and urban visualisation. The emphasis on the more intangible and metaphysical aspects of a built environment; the atmospheric, lighting, acoustic and cultural phenomena of the space. Within the context of the case study, the ‘Kowloon Walled City’, a hyperdense city block in Hong Kong (now demolished), displays digital instruments in Virtual Reality offering a unique way to interpret the metaphysical phenomena of the city's pre-existing heritage. The project creates an engaging way to translate intangible narratives into an interactive user experience that fits the intelligent city realm. Architects use media such as drawings and models to test and better understand their designs. These media are frequently scaled for convenience and reduced to 2D for clarity; however, in relying on these methods, the direct and visceral experience of inhabiting space is neglected. This problem is exacerbated by the picture plane, which acts as an impenetrable window, excluding the viewer from a truly embodied appreciation of the design’s spatial qualities. The project investigates virtual reality (VR) as an intelligent instrument for conceiving architecture without alienating the designer from the user’s perspective. This holistic and subjective approach is a necessary complement to the more abstracted and objective views of architectural tradition: plan, section, and elevation. The recent availability of consumer-grade VR allows the testing of this opportunity without many of the previous technological limitations. Discussing Digital Heritage includes talking about what is perceived as authentic and worth preserving.For ‘Decoding Kashgar’, a multi-disciplinary approach for collecting and realising data was developed. Kashgar is the westernmost city in China and has been part of the Silk Road; a melting pot of cultures. The influence of this on the local culture has been documented in its mud-brick architecture, which in the process of modernisation is now being replaced. To preserve the multi-faceted heritage and provide incentives for engaging in the development of Kashgar, drone footage and public records were used to create a virtual and interactive Kashgar. The game-like construct allows users to generate content that they perceive as authentic. The user-generated content can help identify items of cultural importance relevant to a small number of people and create a modern and intelligent city that the inhabitants identify with. The buildings we live in contribute to our cultural heritage. Although society tries to preserve this heritage the physical and financial burdens often hinder the process. With Virtual Reality (VR) technology, we are closer to both archiving the past and making it accessible for the future in intelligent ways. Wellington’s Gordon Wilson Flats on the Terrace in Te Aro are such an example: planned and built in the late 1950s the building is now deemed an earthquake risk. Strengthening efforts would be very costly, especially if the original design were to be retained. Discussions about the future of the building are ongoing. In the meantime this project has recorded all current and past history, incorporating visual and audio records. These data have been used to create an intelligent VR version of the Gordon Wilson Flats that can be viewed inside and out throughout its whole existence. Architecture is more than an assemblage of forms and spaces. Inhabitants are more than just subjects in space. The work considers a building within a dynamic and fluctuating environment. 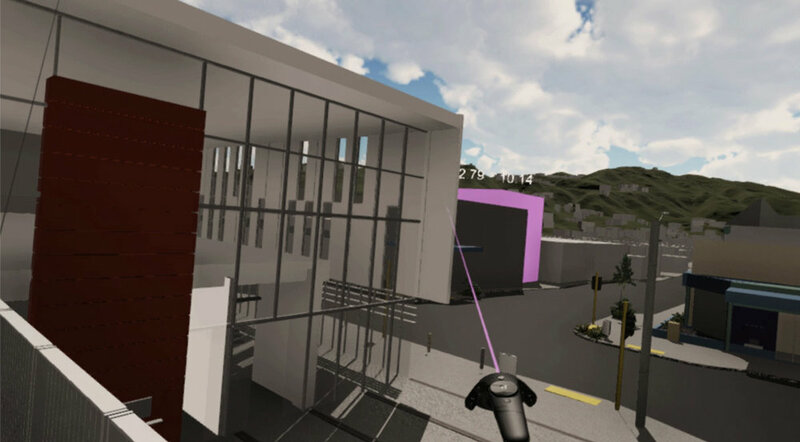 It questions how the use of real-time virtual environments can be used to establish an experience-driven design that attempts to control the intangible, temporal qualities of the real world. The project presents an intelligent design environment where daylight cycles, weather patterns and seasons are allowed to inform the designer as they undertake design activity.